About Uyuni Salt Flats (Salar de Uyuni). Balloon children at the parade in Uyuni. Bolivia. 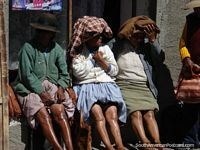 3 woman sunbathe their legs in Uyuni. Children in the parade in Uyuni, dressed in white. Children in the parade in Uyuni, girl in pink. Children in the parade in Uyuni, superheroes.